Blackford's Beauty has been around for a long time. For this version, I took some liberties and simplified the construction. 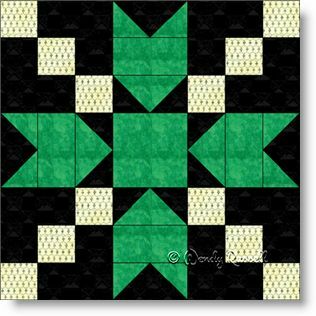 Most patterns use only squares and half square triangles to create this quilt block. By changing up some of the half square triangle patches to flying geese units -- and -- using some rectangles rather than small squares of the same colour, you will find that there is less bulk as there are fewer seams in the completed block. The sample quilts illustrated look quite different from each other, even though they are made with the same blocks. The layout of the quilt blocks is what makes the difference. See what you can create by using your imagination when you decide to put it all together.